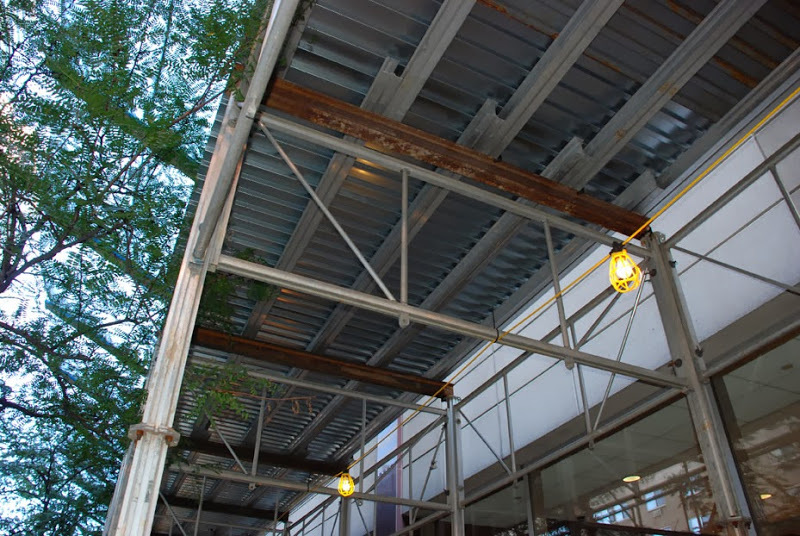 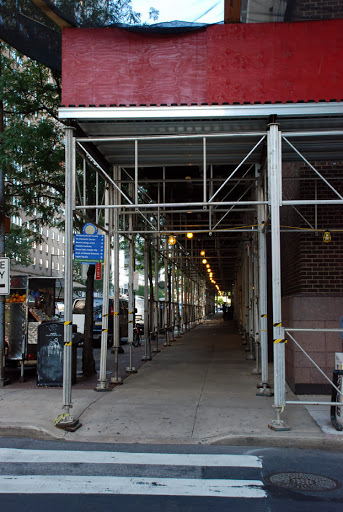 Is a structure built over the sidewalk and around the exterior of a building, while work is occurring, to protect pedestrians from falling debris; also called a “Sidewalk Bridge”, “Canopy” or “sidewalk shed”. 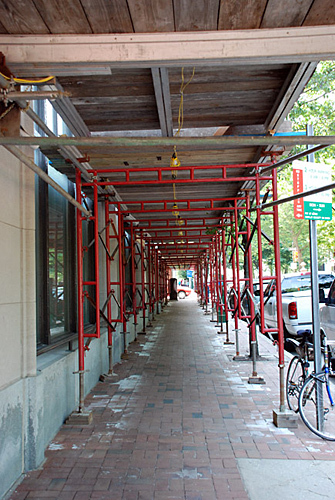 sidewalk shed must be erected whenever materials will be hoisted over the sidewalk, regardless of building height or horizontal distance between building and sidewalk. 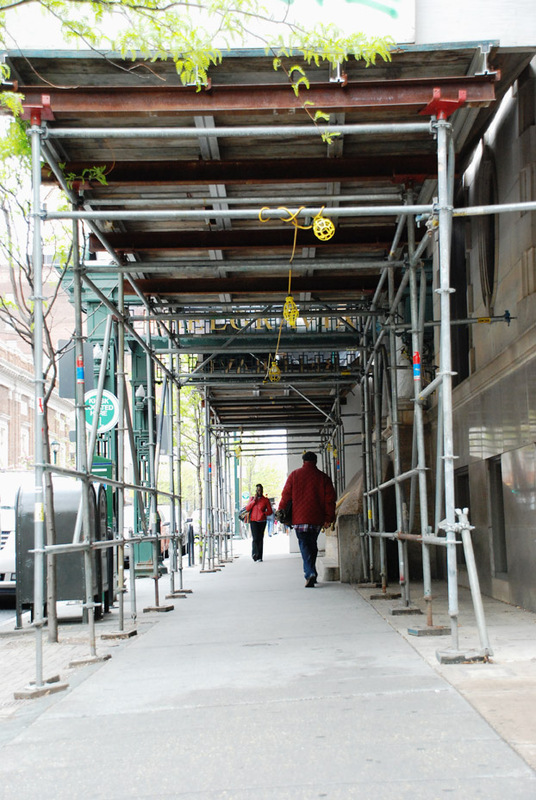 Building owners may have to erect a sidewalk shed before beginning an inspection or renovation of a building facade, construction of a new building or demolition of an existing structure. 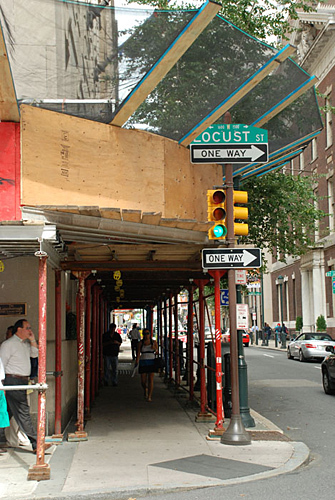 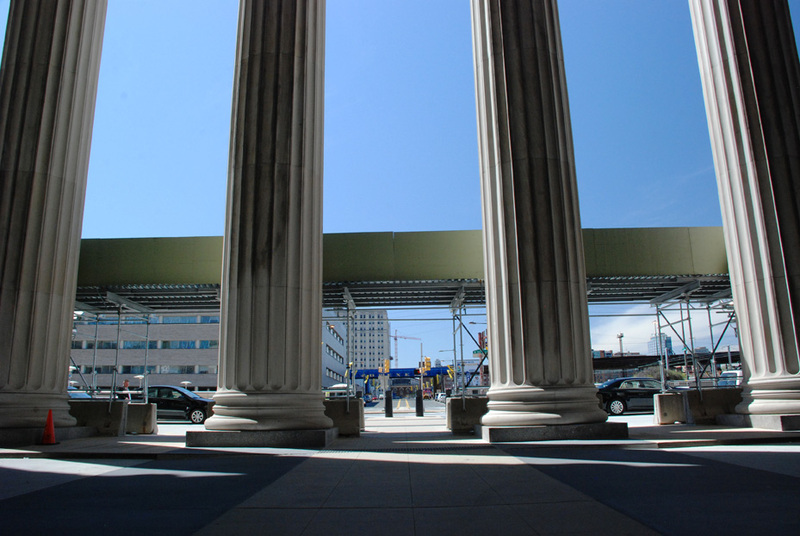 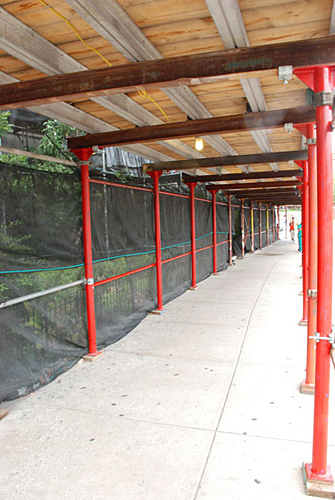 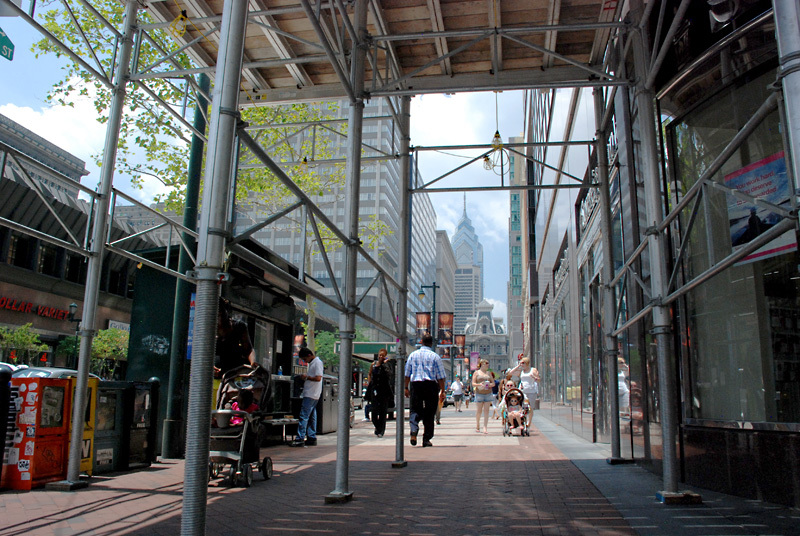 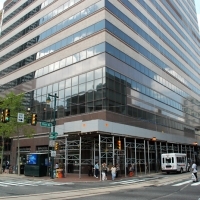 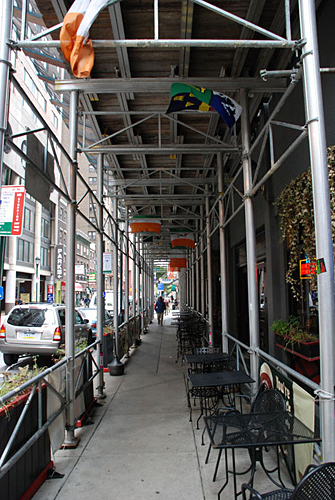 In Philadelphia and most other large cities, a permit is required prior to erecting a sidewalk shed from the department of Licenses and Inspections (L & I). 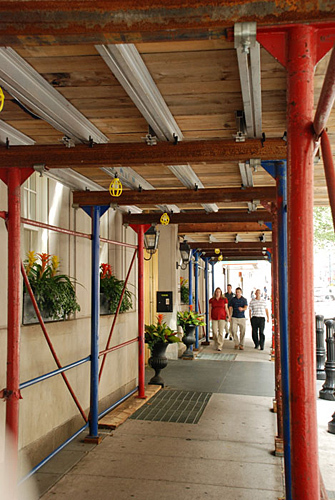 Superior Scaffold custom designs their sidewalk sheds for the each building, allowing for the greatest pedestrian mobility and safety. 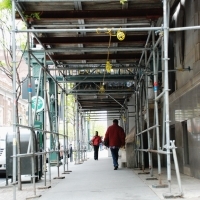 There are many steps that must be taken prior to inspecting, building, or renovating. 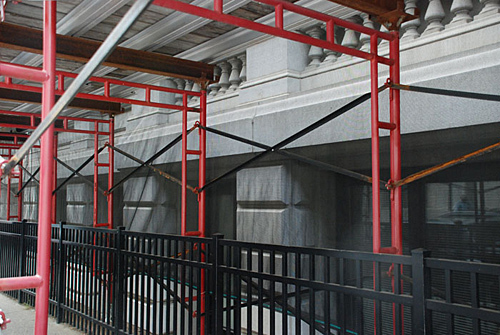 Superior can help you through the entire process, including picking an inspection team, permits, scaffold requirements, management, delivery, erection and dismantlement and many other specialized services. 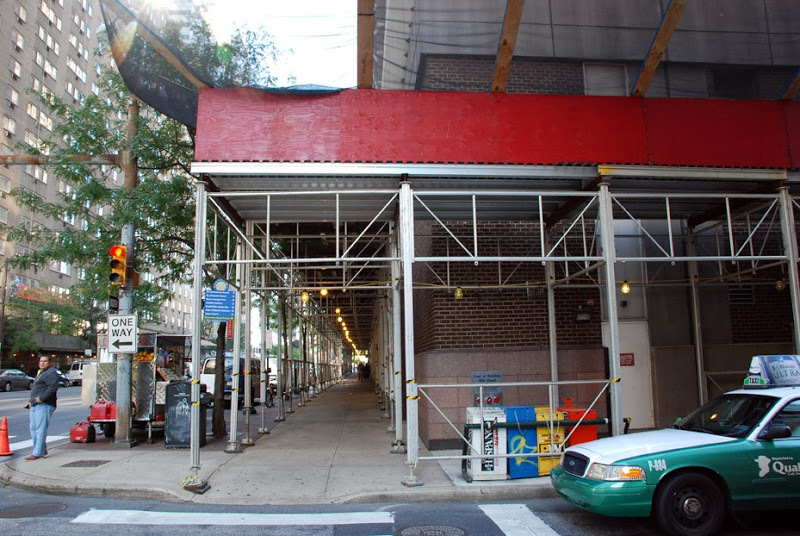 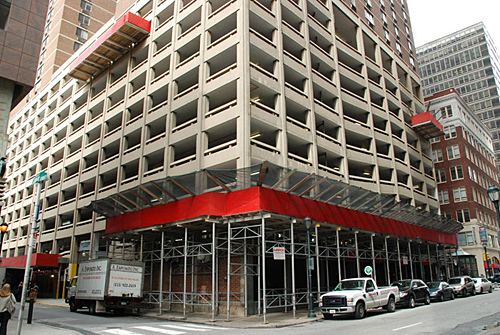 We are Philadelphia’s leader in sidewalk shed services. 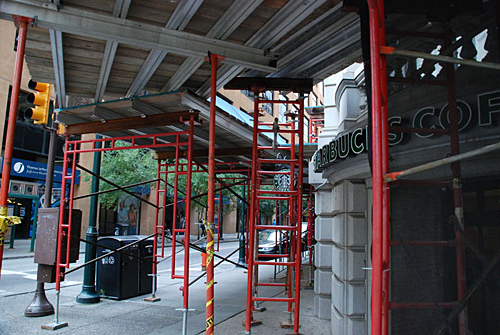 We want your business to continue as usual while being inspected or construction is under way. 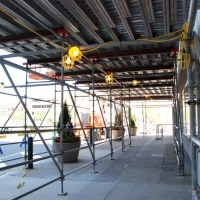 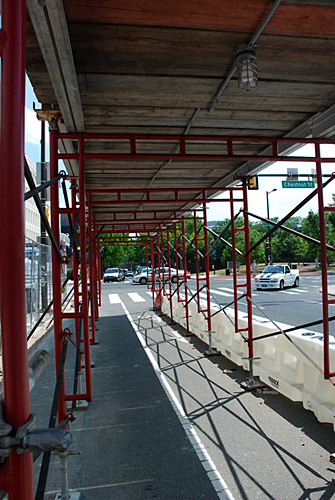 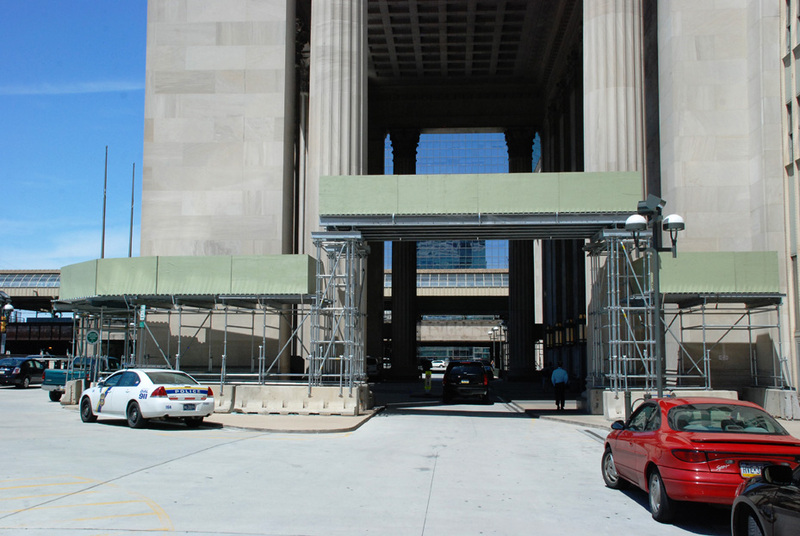 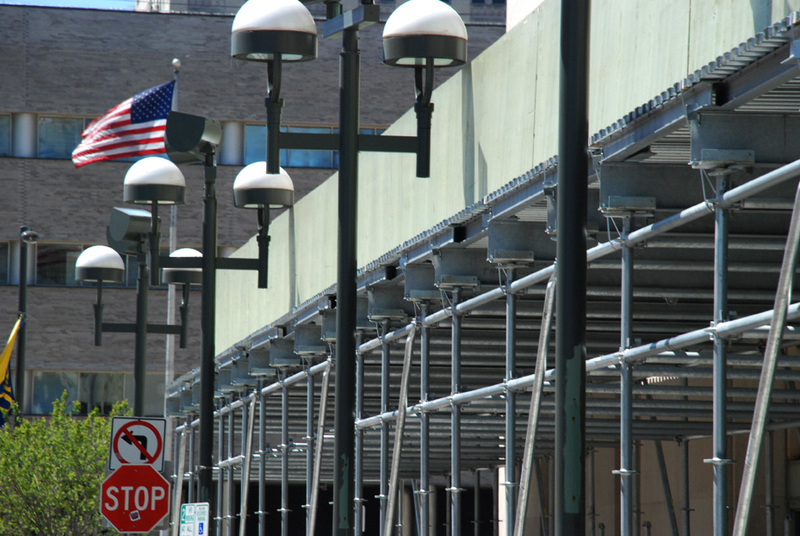 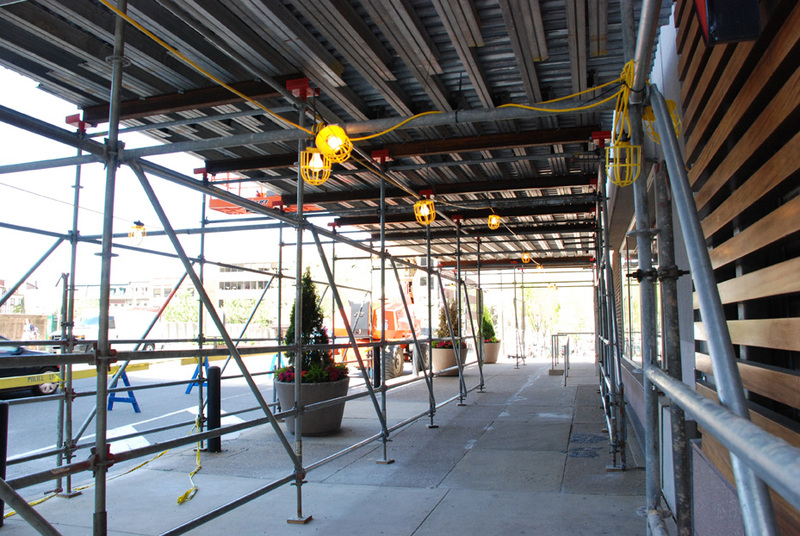 Superior offers several sidewalk overhead protection solutions. 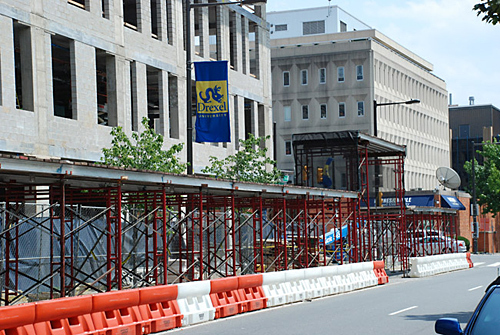 Drexel University – Large canopy/sidewalk shed to allow students to continue their schedules uninterrupted while new construction continued. 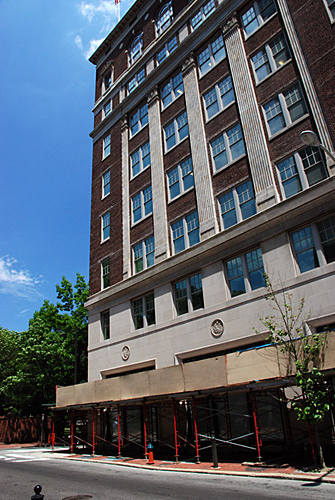 Independence Building – Facade touch-up, repoint brick and mortar, replace windows, re-seal facade, etc. 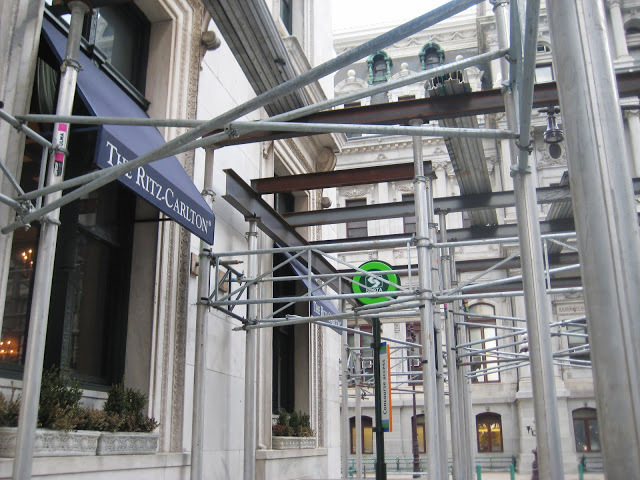 10th / Chestnut – Building facade inspection – a unique canopy design allowing for business as usual around the pedestrian heavy structure. 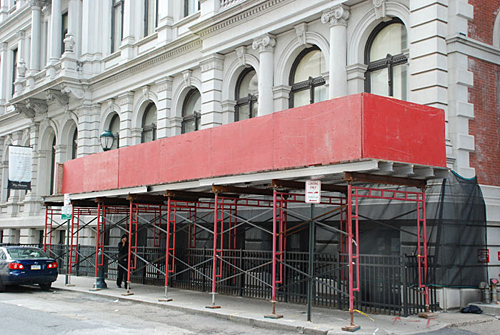 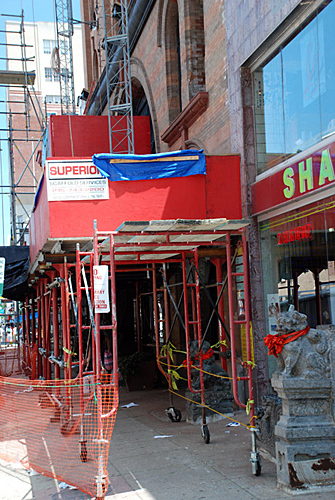 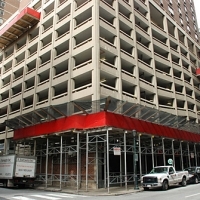 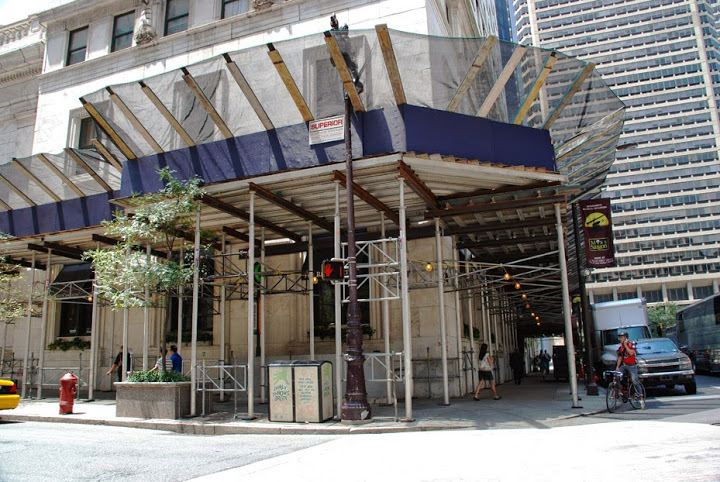 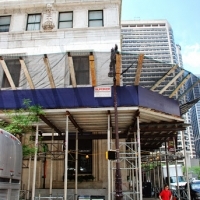 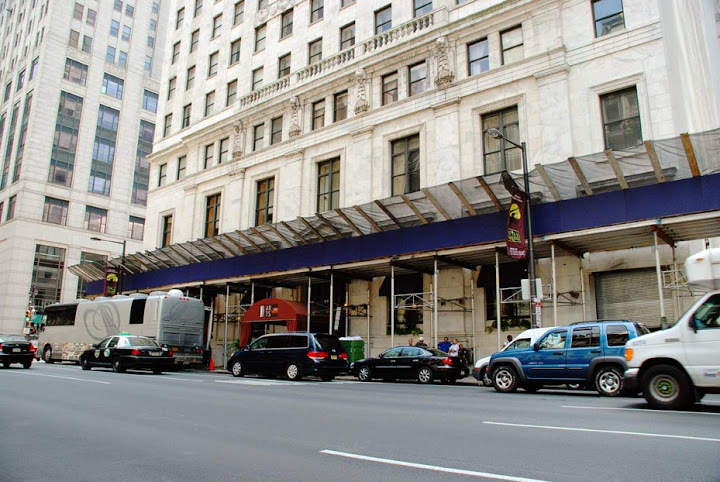 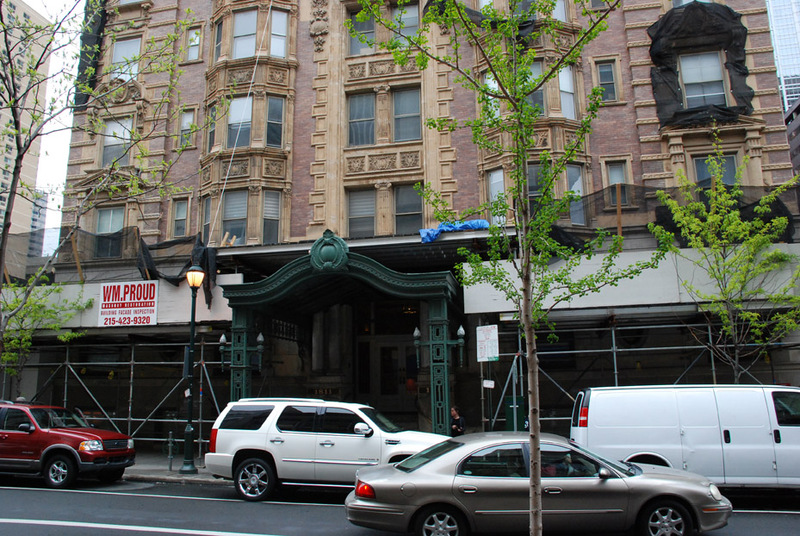 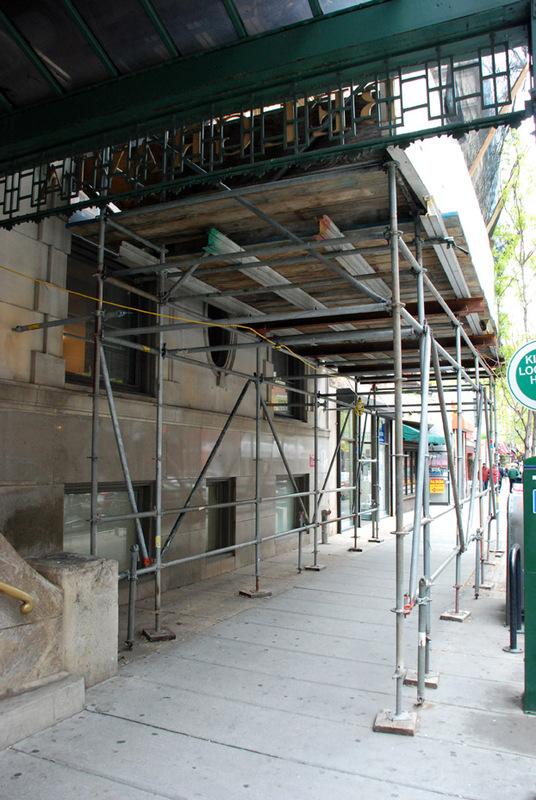 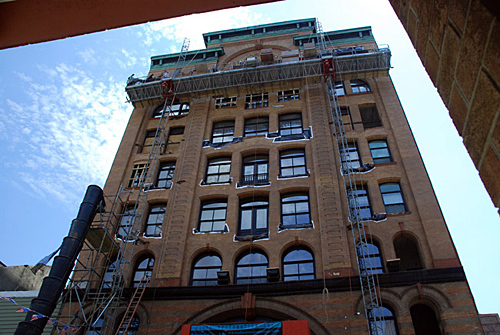 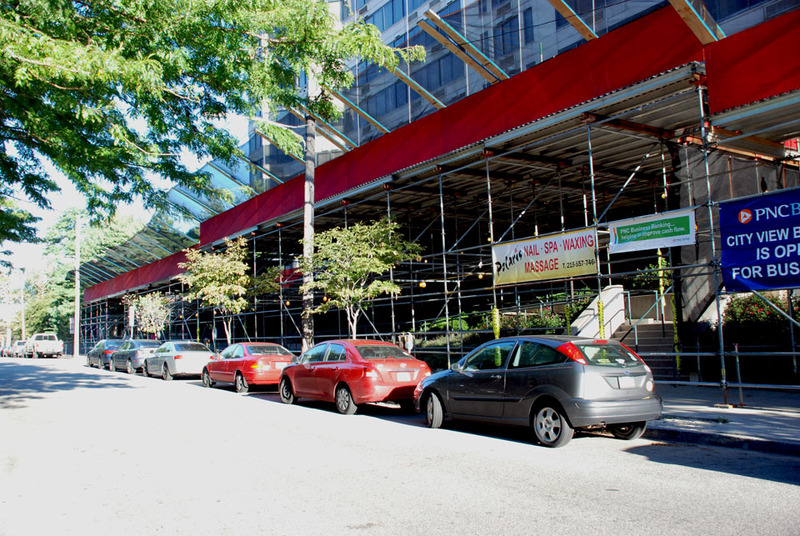 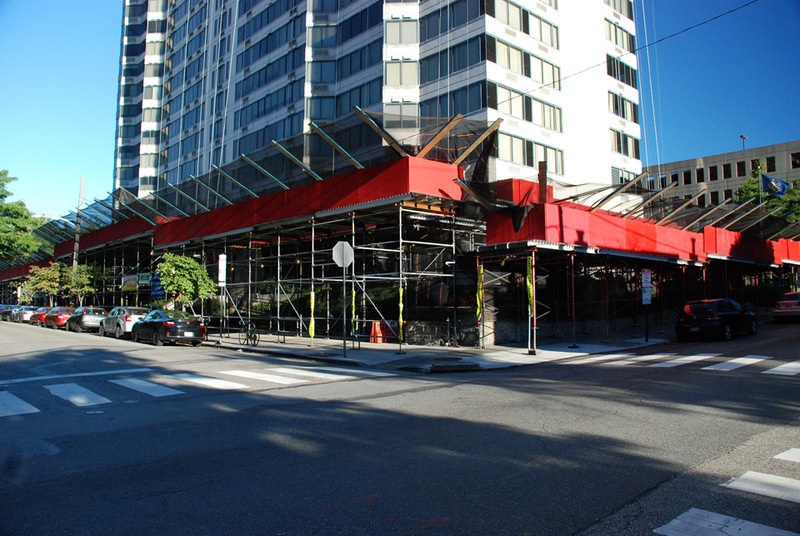 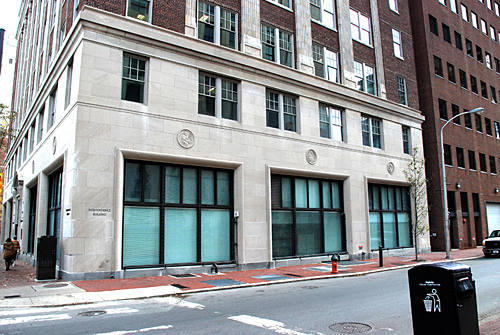 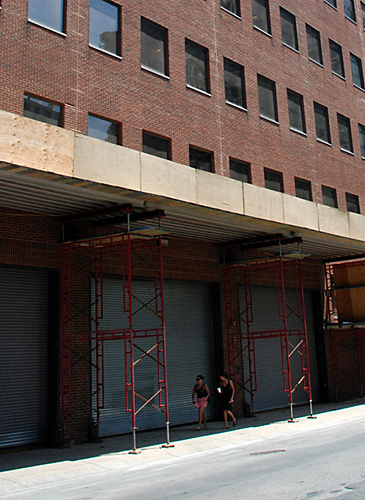 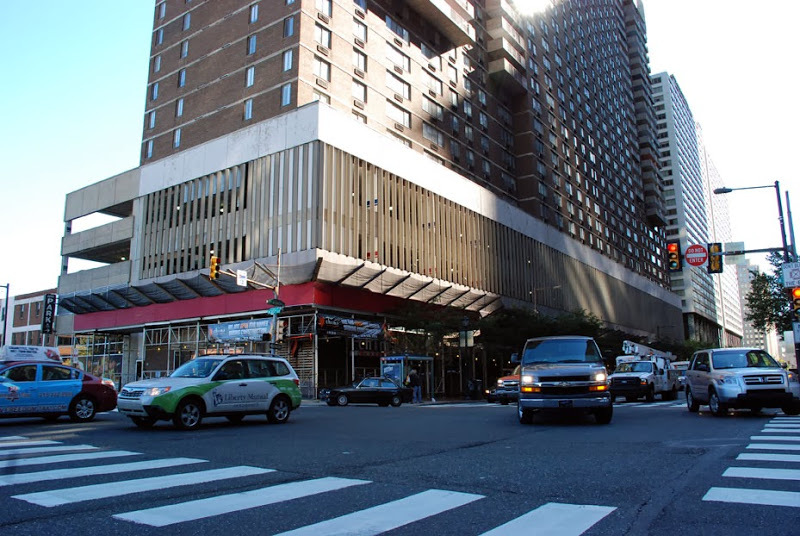 10th / Race – Complete facade repair and window replacement. 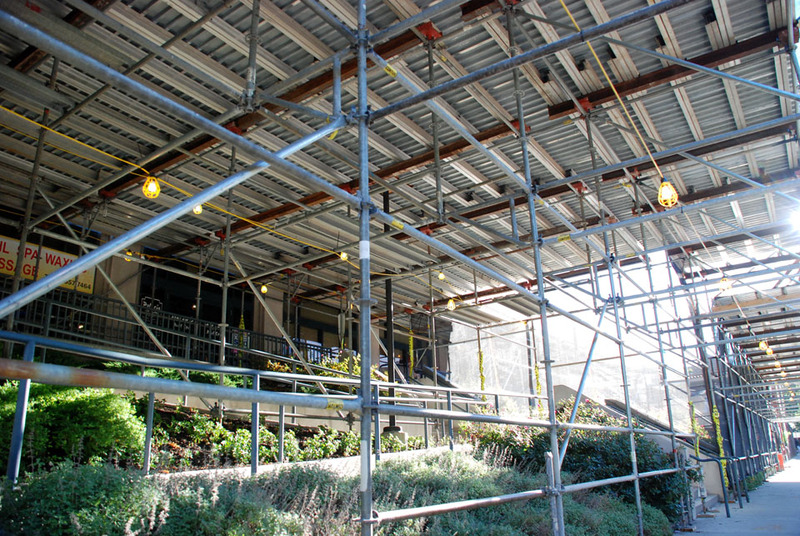 Canopy erected to allow business as usual but also support the mast climber allowing access to exterior windows and surfaces. 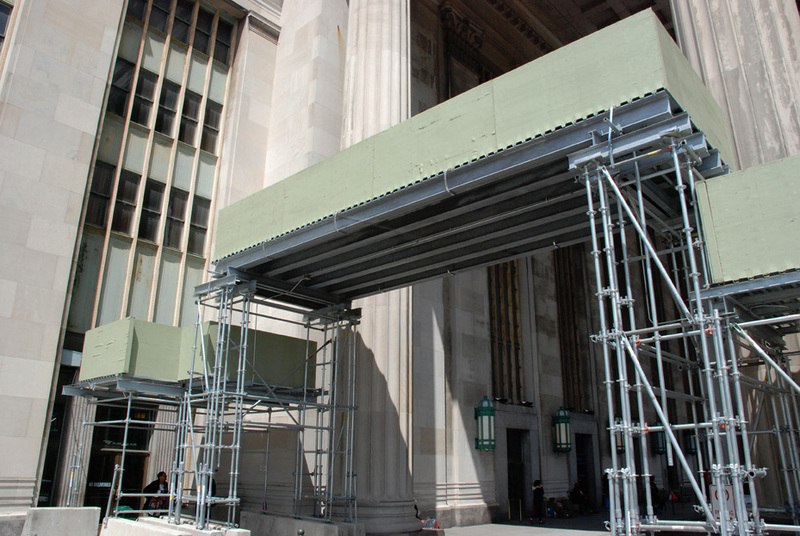 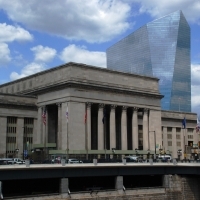 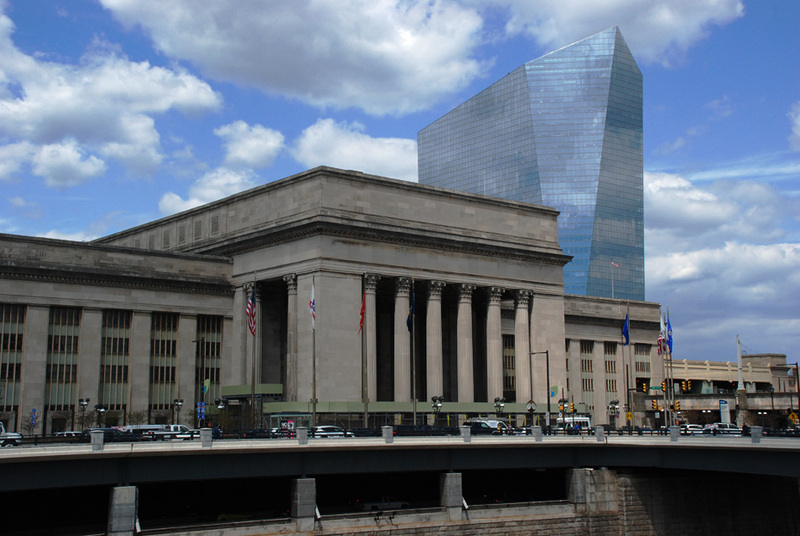 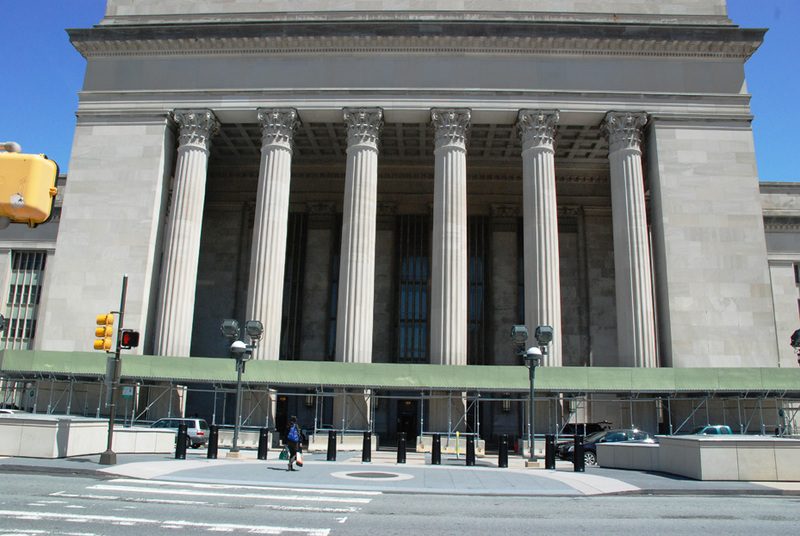 Amtrak 30th St. Station – Large overhead protecton to allow pedestrians, cars and buses regular access during e a complete renovation. 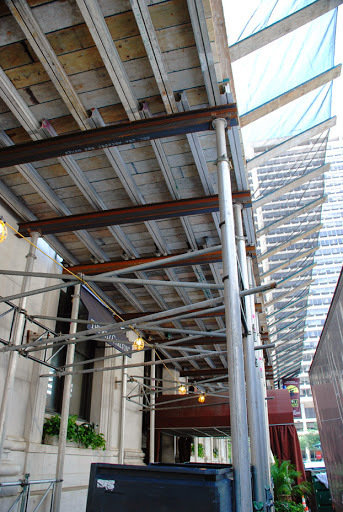 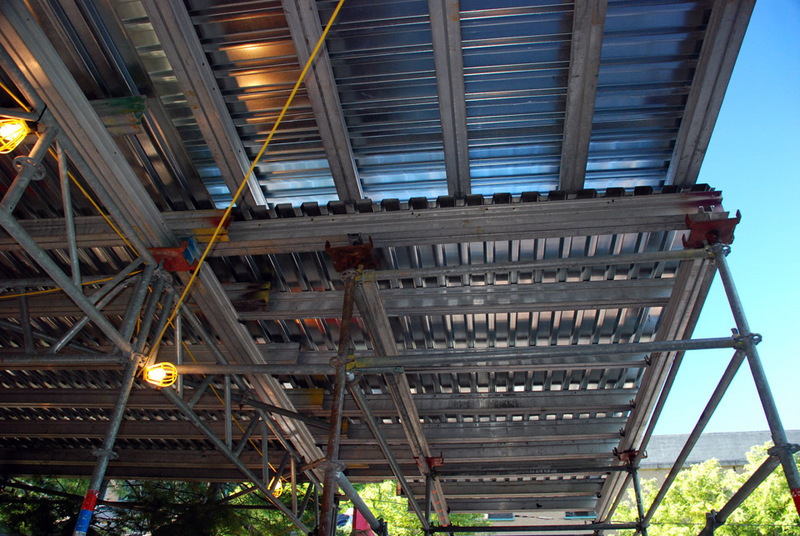 The Kennedy House – Emergency sidewalk overhead protecton, facade damage, erected in less than 12 hours. 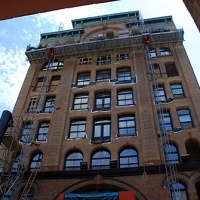 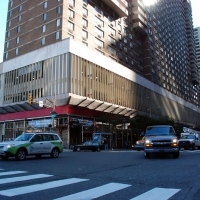 City View Condos – Complete facade restoraton. 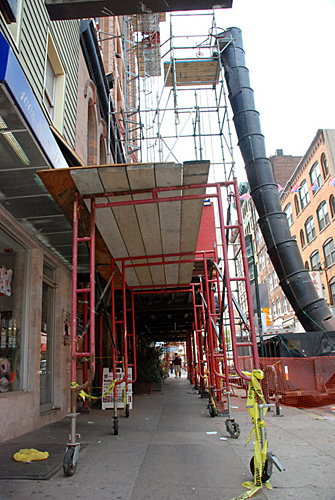 The sidewalk and landing were a large size and system worked best. 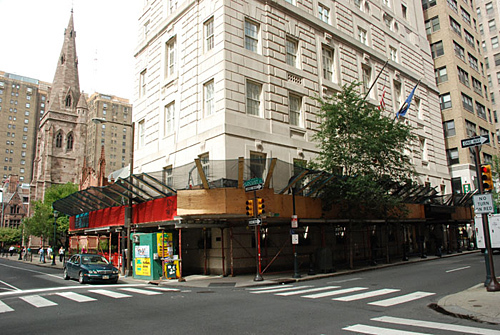 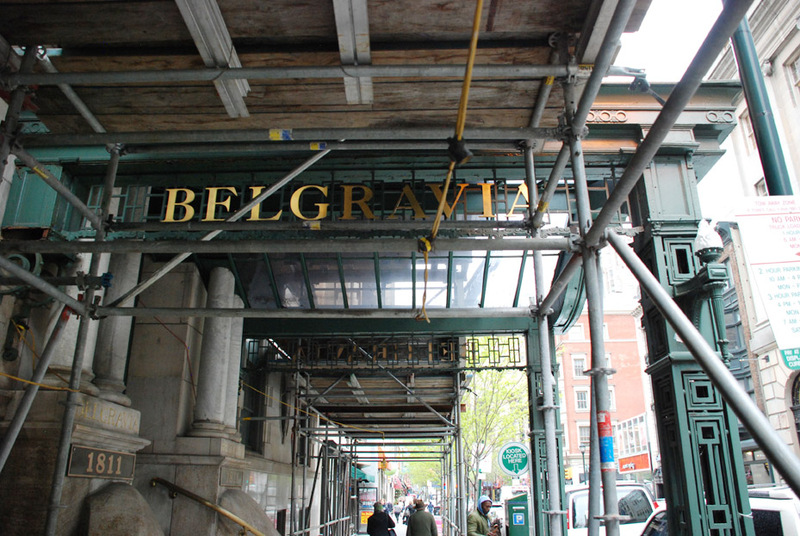 Belgravia Hotel – System canopy was the best choice build around the ornate exterior and large sidewalk out front. 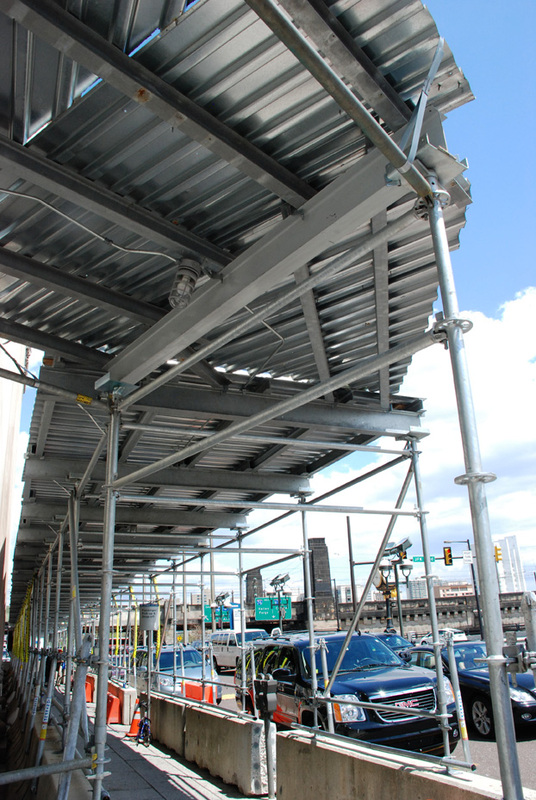 It’s adaptable and flexible. 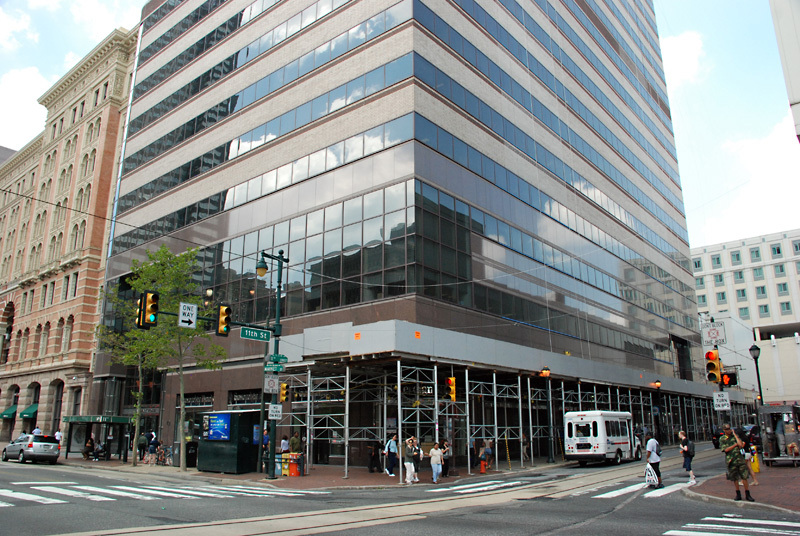 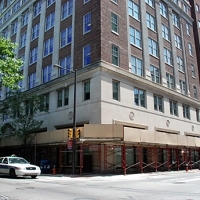 15th / Locust – Window replacement around the entire building. 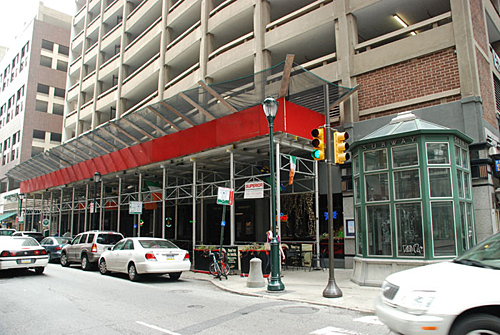 Added a unique second level canopy from the parking garage to protect restaurant patrons below. 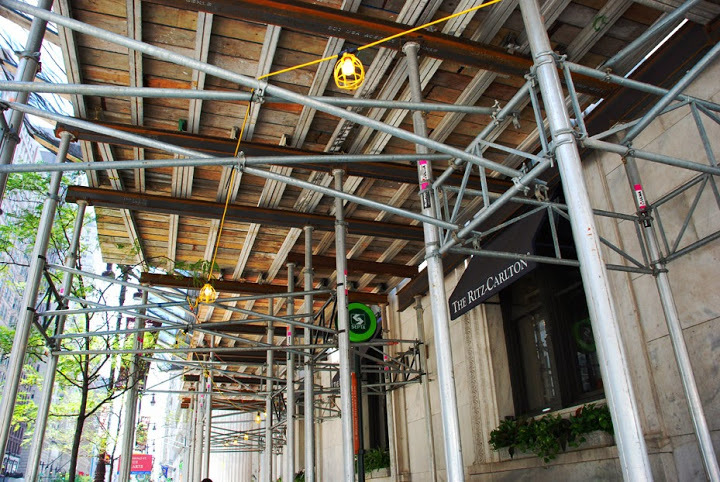 The Ritz-Carlton – Facade restoration. 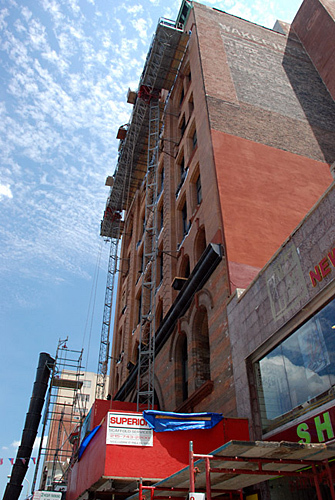 Custom colors to match their branding. 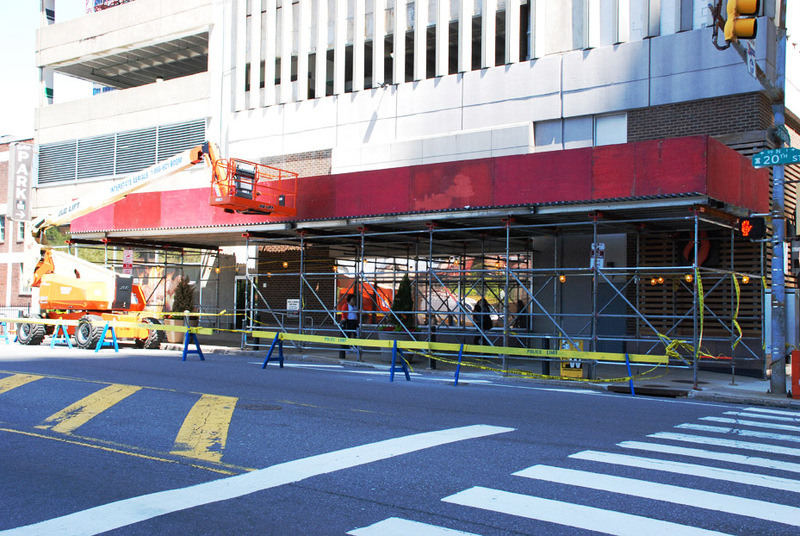 Aramark Tower – Facade restoration and custom colors to match their branding. 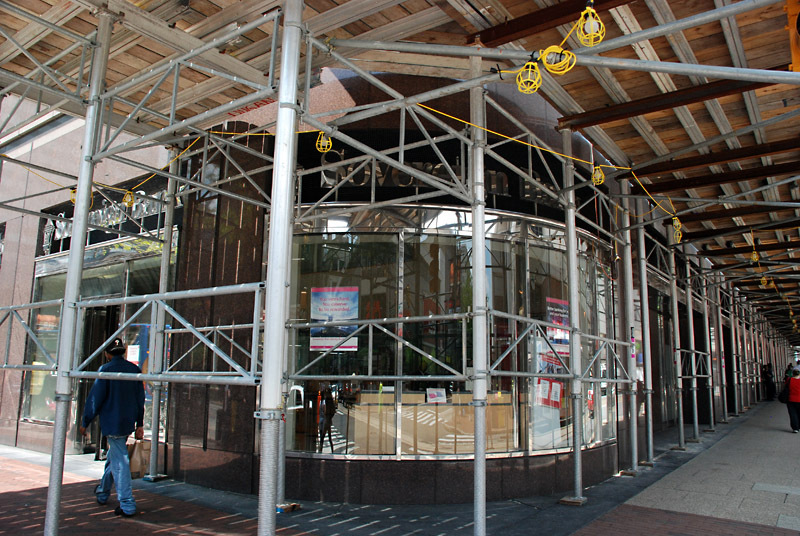 The Kennedy House – Facade restoration, swings, needed the extra room to accomodate the front entrances of businesses. 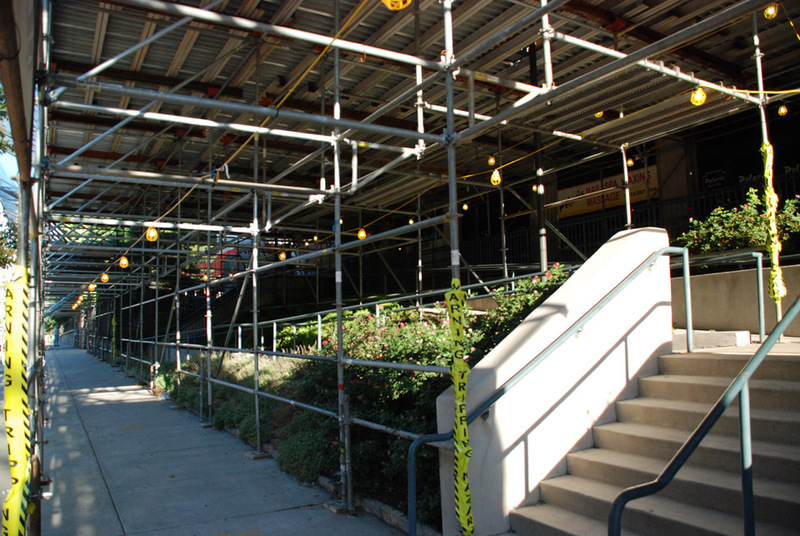 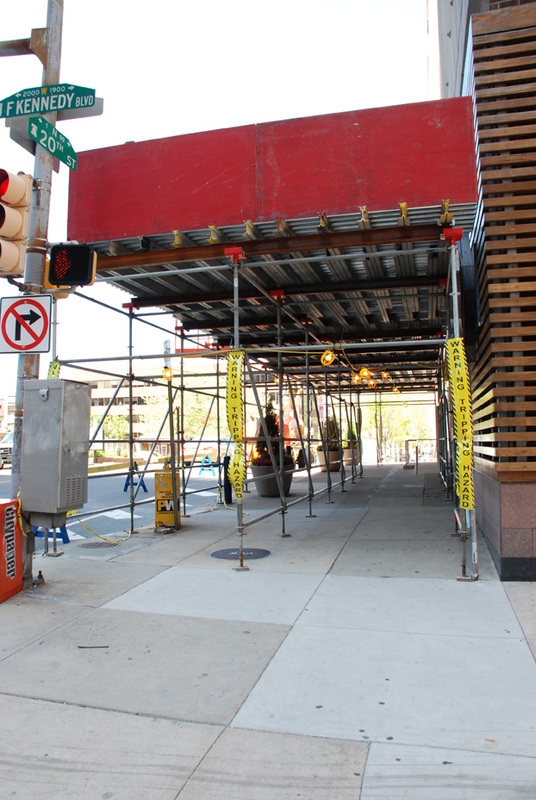 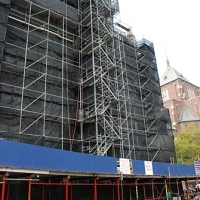 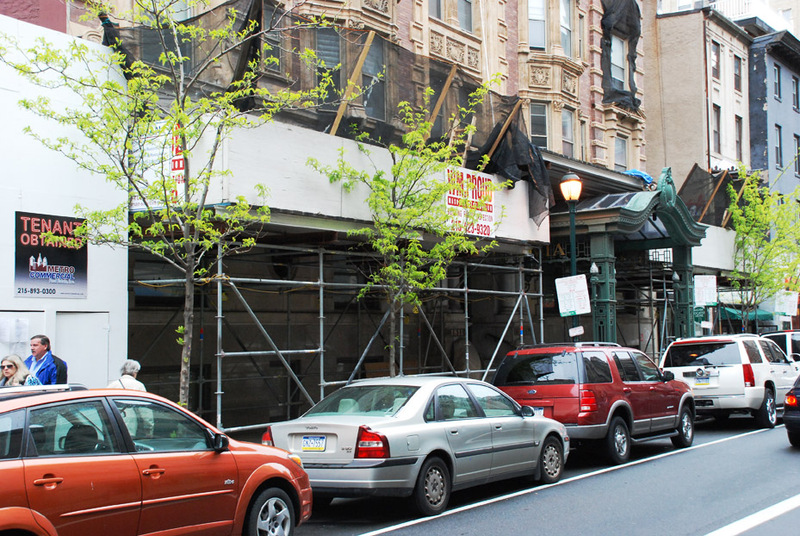 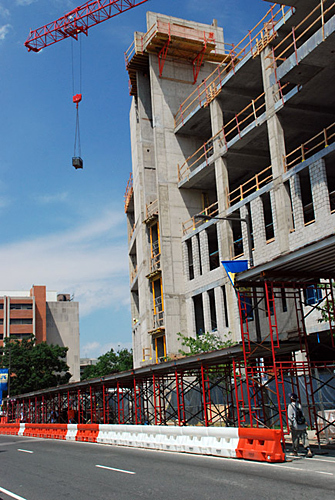 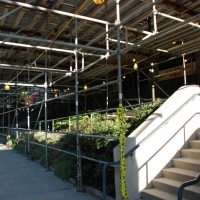 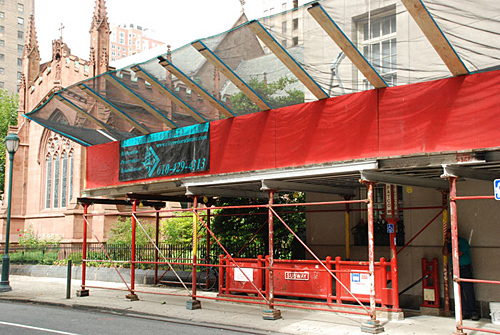 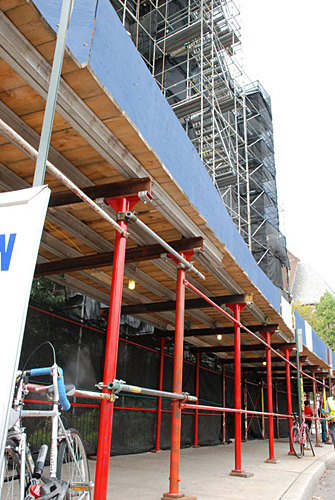 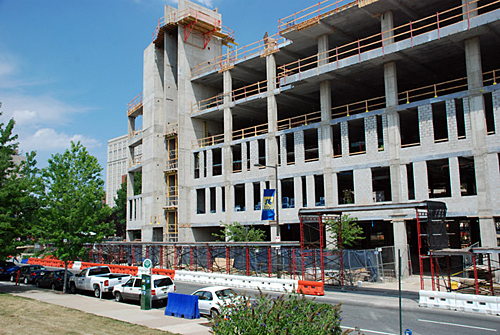 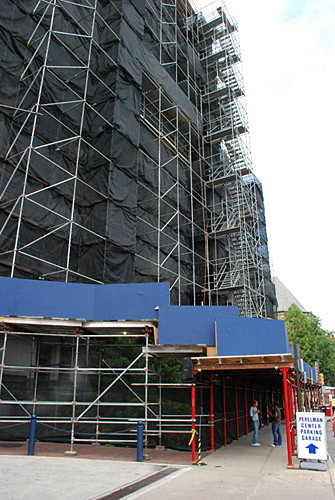 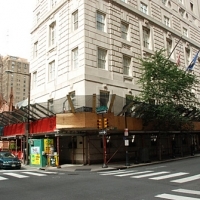 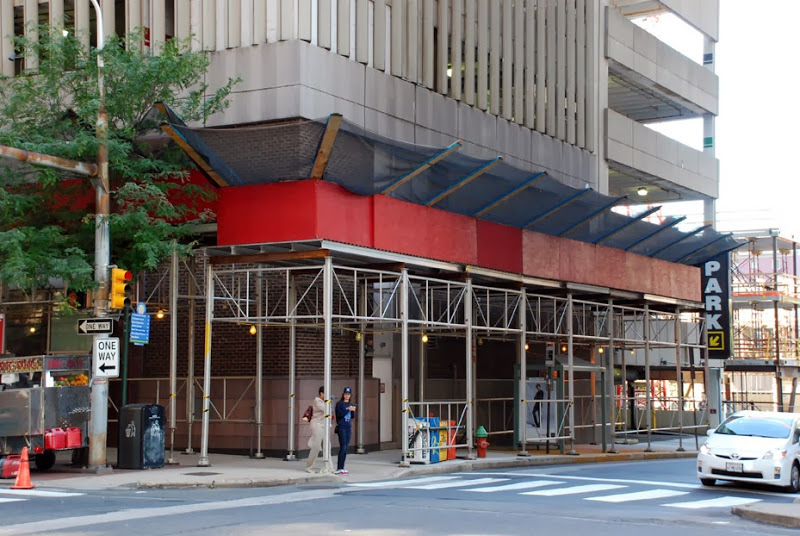 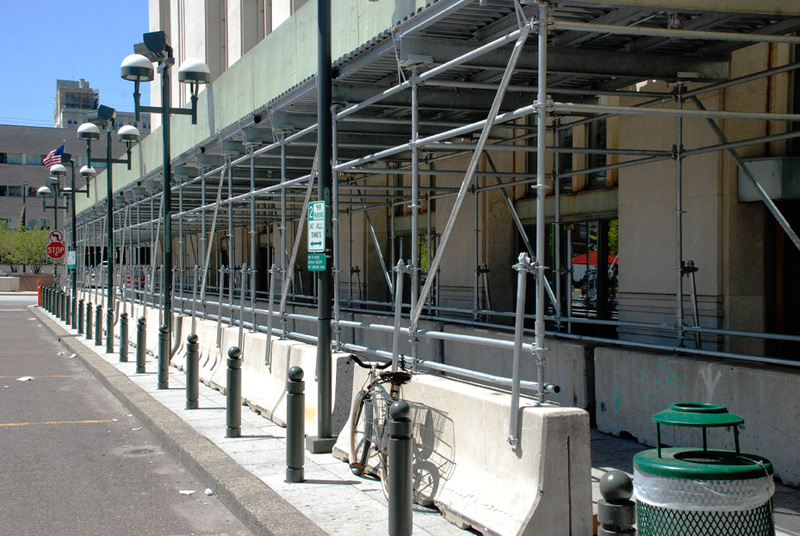 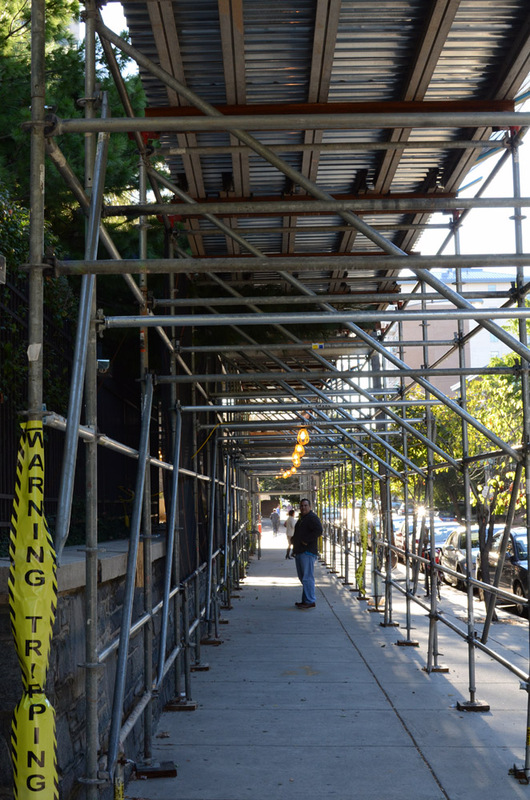 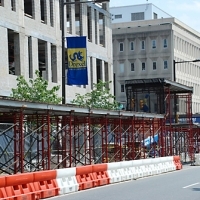 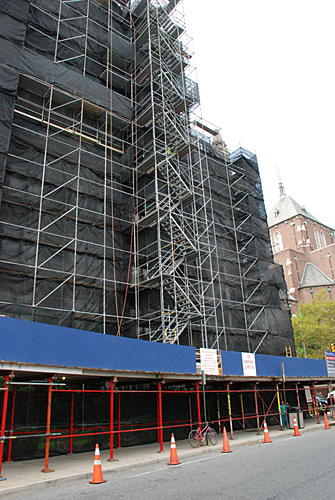 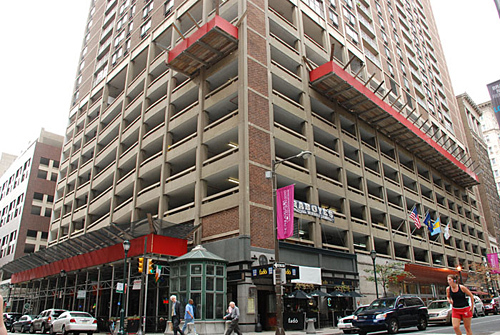 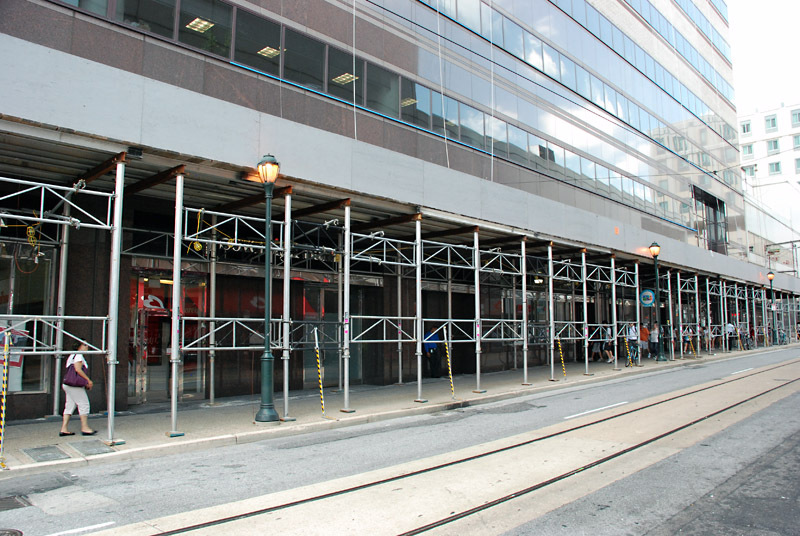 University of Pennsylvania – Erected an emergency canopy, swings, scaffold and netting for a complete facade repair to a section of the University that is pedestrian heavy. 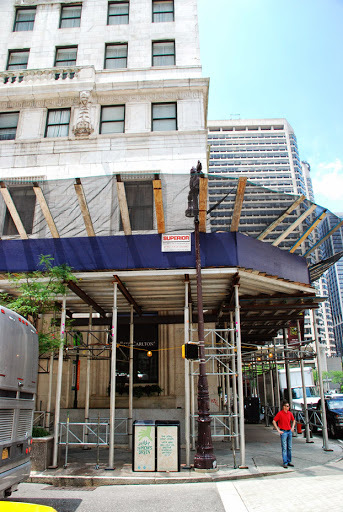 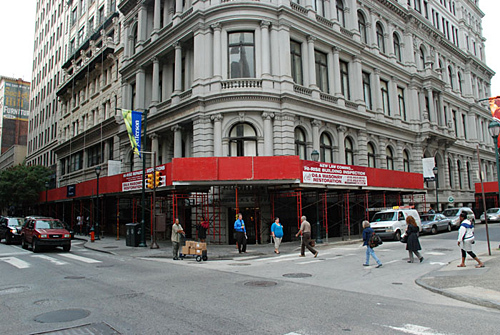 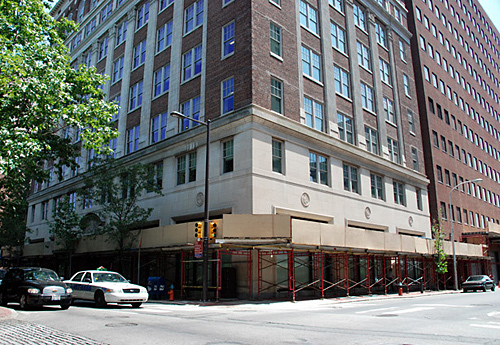 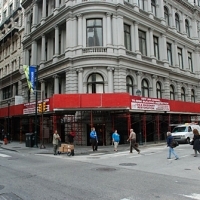 16th / Locust – Facade inspection and repair. 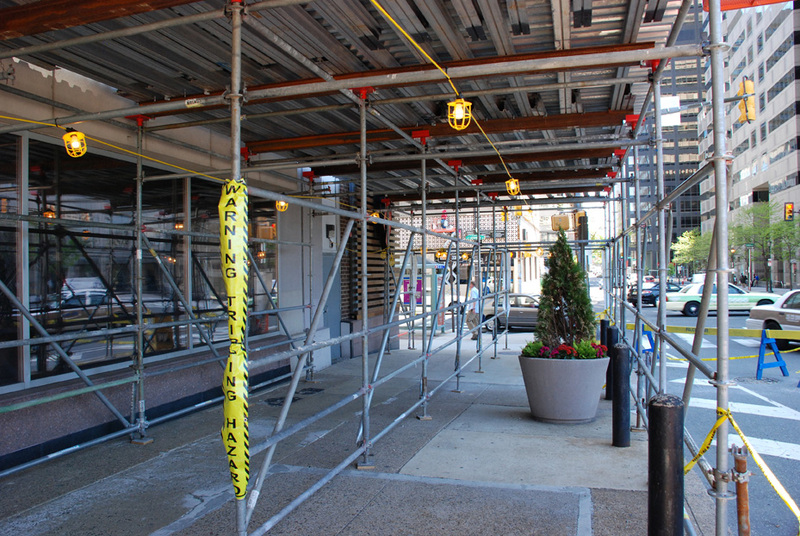 Canopy/Sidewalk shed erected to allow flow of pedestrian traffic while an inspection using a swing stage continued.